Editor's Note: This story has been updated from an earlier version that incorrectly described banner ads as being looked at by the highest percentage of users. A correction has been published here. Madison Avenue may perceive video as the most premium digital advertising format, but new scientific research indicates it may not be as effective as standard or animated banner ads in terms of actually seeing or experiencing an ad’s exposure. The research, conducted by Media Science for a study commissioned by Kargo, utilized neuroscientific methods to measure the biometric responses of 218 smartphone users to three ad formats: standard banners (300x50 and 300x250), animated units, and video units (various sizes). It should be noted that Kargo markets custom-animated units to the ad industry. 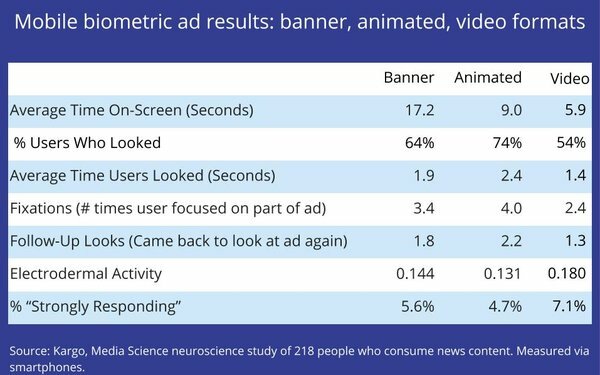 That aside, the study found that standard banner ads had the longest time on screen, though the animated units tested were looked at by the highest percentage of users. Video ads ranked lowest. In terms of the average time spent looking at ads, the number of times the users’ eyes fixated on the ad, and the number of times users repeated looking at the ad, animated units performed best, and video the worst. But when it came to unconscious, physiological responses, video ads performed best. The findings are interesting not just because of the ad industry’s fixation on so-called “viewability” standards -- whether an ad is reasonably viewable on a user’s screen long enough to perceive it -- or because video commands significant premiums over other advertising formats, but because cognition may only be a starting point for the underlying impact that an ad has on consumers. 1 comment about "Scientific Study Finds Video Least Viewable, But Most Neuro Ad Format". Ed Papazian from Media Dynamics Inc, September 17, 2018 at 1:01 p.m.
A question, Joe. Were all of the ads in this study comparable in viewability? In other words, it matters whether each ad in the three groupings could bave been seen in full---100% visibility--- or not in evaluating the findings.